To scope or not to scope? The tab box has served us well for years, but it’s about time we upgraded to something simpler and easier to use. We plan to give our entire website a nice update over the summer, mostly subtle aesthetic changes, but with a big search box upgrade. We’re currently in a discussion about whether to keep the general idea of tabs (expecting users, mostly students, to know ahead of time whether they’re looking for articles or books) or to present one big OneSearch box (à la Google). TL;DR: We plan to present the big-box search that students say they love, but include Article/Book/Media scopes as a didactic hint and visual cue. This post looks at how other libraries present scope options, if any. Our website analytics tell us that students mostly use the scoped options. In the tab box, the 4 highest-use options, in order: database dropdown menu, OneSearch box scoped to articles, OneSearch box scoped to books, and OneSearch box non-scoped. This is strongly influenced by the options that we present to the user. Do we keep these scopes in our redesign? Students compose most of our users. On the one hand, they’ll probably say they’d prefer a big search box, like Google and Amazon. On the other hand, when they approach the reference desk, they’ll usually say, “I’m looking for a book called…” or “I need to find articles on…” So what do we do? Step 1: Let’s see what other libraries are doing. 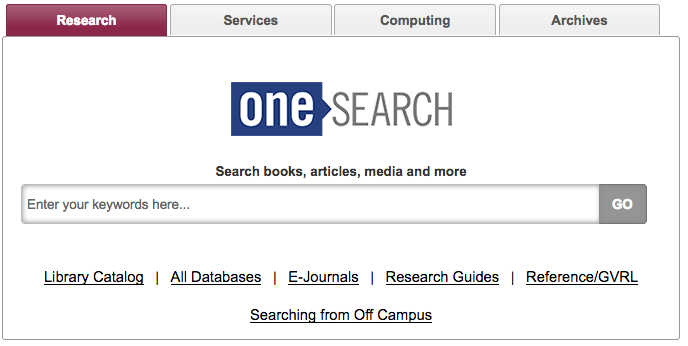 Just about every CUNY defaults to the same discovery layer, OneSearch (aka Primo, the web-scale discovery system from Ex Libris), along with offering a handful of databases and other resources that are campus-specific. OneSearch has the same scope options for every CUNY campus. The Newman Library at Baruch College requires the user to select a scope first before they can type in the search box. Some of these options are links (like Databases) rather than ways to scope the search. Hunter College Libraries default to OneSearch, but offers faded tabs for optional scoping. Media (videos, mostly) isn’t a scope they offer. The College of Staten Island Library does the same as Hunter, but with vertical tabs. 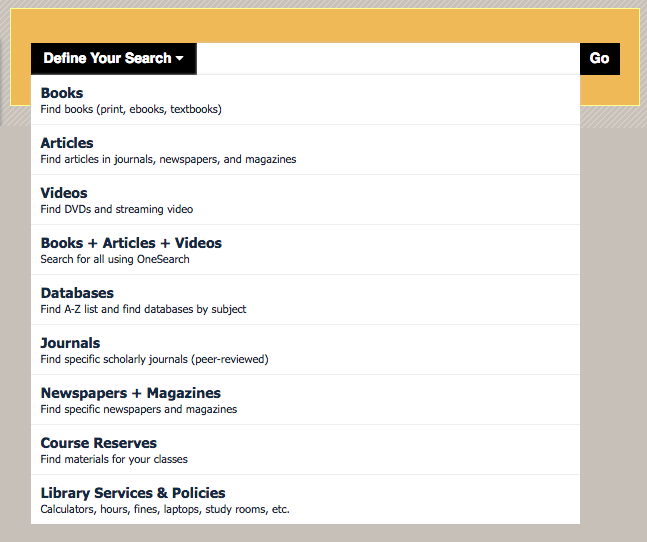 The Schwerin Library at City Tech has a dropdown of scopes, but defaults to a non-scoped OneSearch. Interestingly, there are three options for books: print, ebooks, and both. (Here at John Jay, most students seem to prefer print books, so they’d probably appreciate this option.) Databases are linked outside of the tab box. Brooklyn College Library offers just one search box, for a non-scoped OneSearch search, but provides text links to CUNY+ and databases below. The look of the tab box is very clean and technical, mirroring the look of the UIC site as a whole. A 2017 Code4Lib article, “Participatory Design Methods for Collaboration and Communication,” by Tara M. Wood and Cate Kompare, goes behind the scenes for the UIC website redesign. It’s a fantastic article. The BYU Library has an unlabeled search box for their discovery system (with an advanced search option subtly indicated), and includes lovely buttons below advertising specific resources and majorly highlighting their libguides. So it seems that most other libraries default to an “everything” search, but offer scope options. That seems like it might be a good solution for us, too, but John Jay students are a unique group. What will work for them? 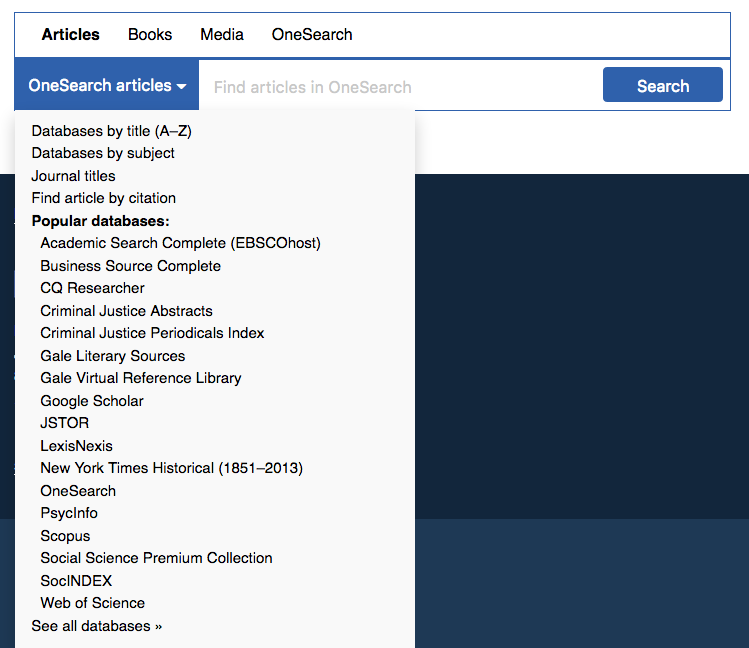 Defaults to non-scoped OneSearch, as most other CUNYs seem to do, but gives the option for Articles (and peer-reviewed articles), Books, and Media. This, to me, seems like a natural next step: Presenting the big-box search that students say they love, but prominently displaying scope options as a didactic hint and visual cue. This gives the user a hint as to what OneSearch includes. Will students actually use these scopes? We’ll have to test to find out. One big issue with the “peer-reviewed” checkbox is that OneSearch can only narrow results down to articles published in peer-reviewed journals, but not necessarily peer-reviewed articles, so reviews and columns will show up in the results. We discussed this in our Web Committee, and this is apparently a problem with pretty much all discovery systems, so… Oh, well, we’ll just live with that? I know many students will appreciate this kind of filter, even if it’s problematic. We can use explanatory hover text. Database-specific searching is still how we teach some classes and how many students and faculty alike prefer to search. The tab includes the Popular Dropdown menu, which also directs users to browsing databases by title/subject (duplicating the links below the dropdown menu). Here, OneSearch is the default search for every tab, and only Articles has any other option. Inspired by Baruch, I faked parts of the dropdown menu — that is, clicking JSTOR won’t present a JSTOR-only search box, it will just open JSTOR as a link. In a recent Web Committee meeting with other John Jay librarians, we agreed to pursue the first tab box, but perhaps with refinements. Next week, we’ll do some guerrilla usability testing outside the cafeteria so that we can see whether students find the new tab more or less usable. Stay tuned!